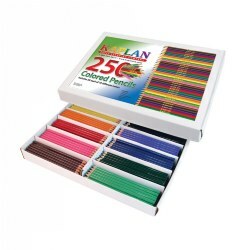 Kaplan provides pencils in different sizes to aid in early childhood development. Products include large grip pencils, multicultural pencils, scented pencils, and pencil grips. 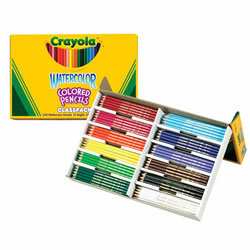 Bright and colorful pencils in 8 popular multicultural colors and earth tone colors. The earthy colors are good for drawing yourself, your friends and the landscapes that surround us. 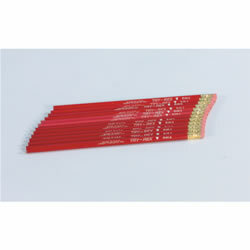 12 individual packs of 8 pencils. 3 years & up. Pencils are the foundation of self-expression and new ideas. 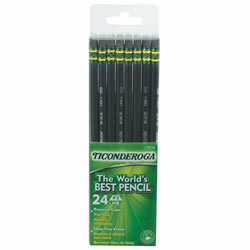 With the Ticonderoga® #2 Black Pencil Set, children can draw their vision of the world! 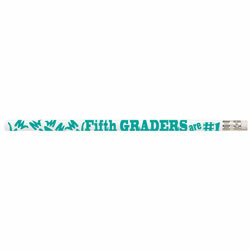 These pencils are great for homework assignment, writing projects, recording scores during an exciting game, and so much more. These pencils are shaped for the purpose of comfort. 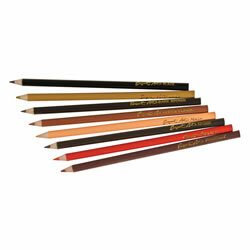 Pencil is made of reforested quality cedar wood and includes a latex free eraser for easy, clean corrections. PMA certified. Non-toxic. 24 pencils total. 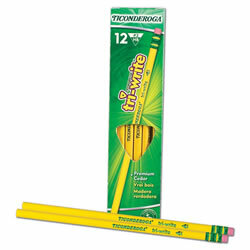 Try-Rex primary pencils are triangular shaped to keep the pencil from turning. Great for beginning writing skills. Sold by the dozen. 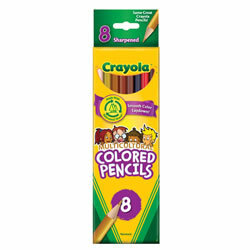 These pencils let children color expressive skin tones, shades, and blending colors that enhance hands on learning. Set of 8. 5 years & up. 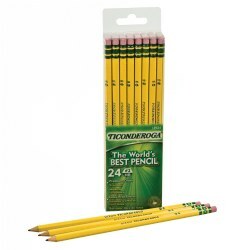 These are the world's best pencils! The satin smooth finish enhances writing comfort while an exclusive graphite core formula gives you extra smooth performance. 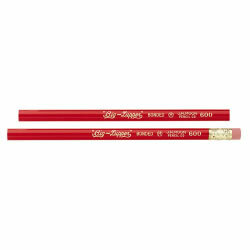 Crafted with premium wood, these top quality pencils feature latex-free erasers to provide easy, clean corrections. 72 pencils. PMA certified non-toxic. 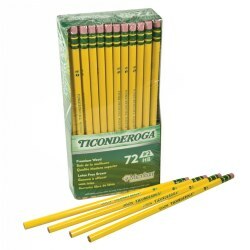 Standard # 2 pencils in pack of 72. PreK - Grade 1. These jumbo pencils are great to start children off with. Helps to develop fine motor skills while encouraging them to write and draw. 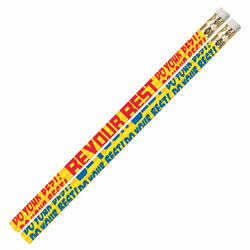 Pencils that include an eraser have a quality latex-free eraser for clean erasing. Pencils measure 7" to 7 1/2" long x 13/32" diameter. PMA certified non-toxic. Sold by the dozen. This versatile pencil grip will stretch to fit over large pencils and paint brushes. Ergonomically correct for both left and right-handed users. Colors may vary. 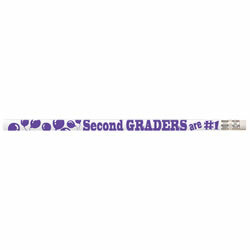 Character pencils boost self-esteem. 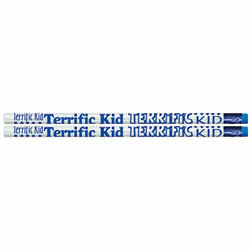 All students are terrific, so why not let them know it? 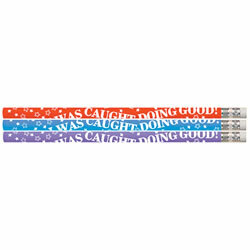 'I was Caught Doing Good Pencils' come in a set of 12. Team spirit for any grade. Wood-cased #2 pencils are made in the USA. 12 pencils per unit. Character pencils boost self-esteem. All students are terrific, so why not let them know it? 12 per unit. 3 years & up. 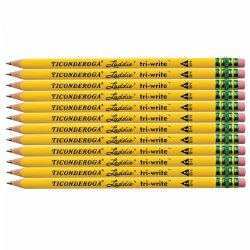 The Ticonderoga® Tri-Write Laddie Triangular Pencil is a slightly over-sized #2 pencil for transitioning into cursive handwriting. 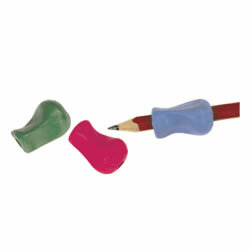 Features a triangular barrel to assure proper finger positioning and extra-large, latex free erasers. This pencils thick graphite core delivers a broad, smooth line to make sure you're clearly understood each and every time. 36 pencils. PMA certified non-toxic. 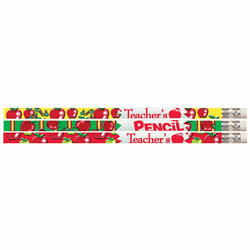 These teacher pencils are fun to use or a bright addition to any students birthday! This sturdy, organized classpack of watercolor colored pencils includes 240 thick, pre-sharpened watercolor pencils in 12 rich, vivid colors. Add a few drops of water and blend with a brush for watercolor effects or use dry like traditional colored pencils.